Let it be known that I'm a sucker for anything related to Pride & Prejudice. I too swooned over Darcy in my teens and, to this day, have a dog-eared copy of the book that I devour every now and then. Is it any wonder then that I'd want to see where Jessica Grey took me? 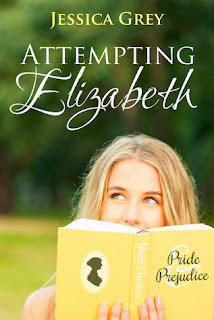 I couldn't wait to see how Kelsey's story would mesh into Austen's world. I was instantly drawn in by Kelsey and her friends. They acted exactly as I hoped. Teasing one another, making movie references, and trading the best kind of snarky remarks. When Mark wandered into the picture, I was smitten. Tall, dark, handsome and Australian? That should be an illegal combination. I loved watching the battle of wits between these two at the beginning. Then the Austen aspect came into play and, initially, I loved it. Watching Kelsey bumble her way through a character's life, and try to spice things up, made me giggle out loud. However the further the story progressed, and the deeper she sank into Mr. Darcy's world, the harder time I had not skimming pages. I love Pride & Prejudice, but I've read it. I wanted more Kelsey and less Elizabeth. The ending made up for it a bit, as happy endings often do. I'm just not sure how I feel about the last third of the book. If you're an Austen fan, you'll definitely get some enjoyment out of this book. If you've ever wondered what takes place "off screen", between the big scenes of the book, you'll see. Pick this up if you're looking for a lighter read with a happy ending.